Why, Anyway, Do We Quote? Quoting was something I didn’t even think about until I read Why Do We Quote. 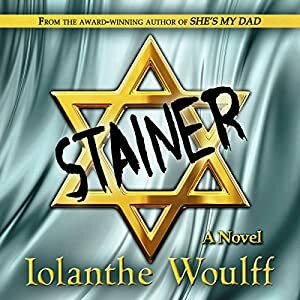 What made you realize quoting would be such a rich topic for a book? To elaborate, and as I explain in the Preface, until this book somehow crept under my guard I hadn’t thought I was much interested in quoting or quotation: something to be deployed with care in some settings, no doubt, but not a thing to be investigated. Certainly I had learned to use quote marks at school and later to wield quotations in academic writing, and had become aware of copyright obligations and the current concerns about plagiarism and about unauthorised words floating free on the web. I was also vaguely aware that words and voices from elsewhere ran through what I said, I read them in books, recognised them in formal speeches, heard them in conversation. But I had just come to accept this as part of common practice, not anything to be really noticed, far less to arouse particular curiosity. As I thought about it, I realised how little I knew about quoting and quotation. What does it mean, this strange human propensity to repeat chunks of text from elsewhere and to echo others’ voices? How does it work and where did it come from? Does it matter? Why, anyway, do we quote? 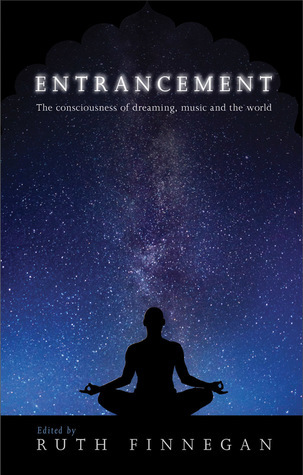 I started by reflecting more carefully on my own experience and was startled by how quoting permeated my world. And then I wondered how others were using, or not using, quotation both nearby and in far away times and places. On some aspects I found a vast and fascinating literature. But there seemed no single account that directly tackled my questions about just what ‘quotation’ and ‘quoting’ were, how we had got to where we now are, and how in practice these had been used and conceptualised. This led me to considering how people here and now actually use quotation (in practice, that is, not just according to the grammar books) and also, going on from that, whether we might understand these present practices better by exploring something of their background and whether the problems currently causing concern belong just to the 20th and 21st centuries, or perhaps have longer roots. And then? Well, I just couldn’t help writing It! Took longer than I expected, with part of the fun being finding illustrations (yes IMAGES are part of the story). I’d say it is my best academic book, perhaps alog with Communicating to which is it in a way linked (I leave out my novels like Black Inked Pearl). Did you learn anything that surprised you about quoting while you prepared this book? YES, and was amazed: about (many) people’s ACTUAL perspectives be on quoting -regarding it as a way of ‘showing’ off: showing off the quoter’s supposedly superior learning or status, putting you down. I was stunned. As an academic had always assumed that (properly attributed) quotation was unquestionably a Good Thing. It would never never have occurred to me without the extensive comments from the wonderful ‘Mass-Observation’ writers (results of this and other enquiries conducted and housed under the auspices of the University of Sussex (www.massobs.org.uk/). With this book you shed new light on ideas such as ‘imitation’, ‘allusion’, ‘authorship’, ‘originality’ and ‘plagiarism’. How has quoting changed those ideas? Mainly I think that I now realise how these concepts shade into each other and overlap (there is a stunning diagram at the start by Mark Cain showing this – and more) . Also how they are ALL socially managed and controlled in some way, and how the telling-off for ‘plagiarism’ of students and other ‘subordinate’ individuals is partly an exercise of power. We all in a way plagiarise (ourselves among others) when – almost all of the time – we in some way allude or quote. This was a real revelation to me. Also how invisibly pervasive all these practices, and similar ones, are in our speaking and writing. There is a lot drawn from anthropology and cultural history. Is there any one event in history that affected quoting dramatically? Or did it all happen slowly over time? Slowly and over time I think. Quoting and quotations have been there from the very very beginning – though it’s true that some individuals and sources get quoted more than others ( or have attributed to them things they DIDN’T actually say) , like George Washington, Goethe, Disraeli, the Bible. People quote Shakespeare all the time, often without realising that it IS a quote, the words just a special ring to them – isn’t that one of the points of quoting. Quoting is all around us. But do we really know what it means? How do people actually quote today, and how did our present systems come about? This book brings together a down-to-earth account of contemporary quoting with an examination of the comparative and historical background that lies behind it and the characteristic way that quoting links past and present, the far and the near. Drawing from anthropology, cultural history, folklore, cultural studies, sociolinguistics, literary studies and the ethnography of speaking, Ruth Finnegan’s fascinating study sets our present conventions into cross cultural and historical perspective. 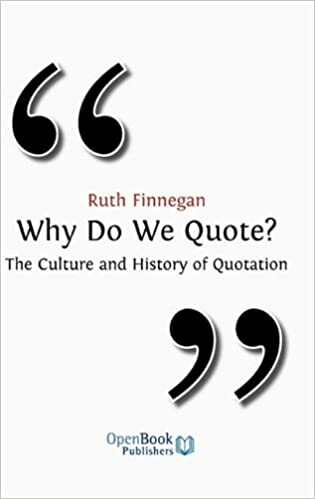 She traces the curious history of quotation marks, examines the long tradition of quotation collections with their remarkable cycling across the centuries, and explores the uses of quotation in literary, visual and oral traditions. 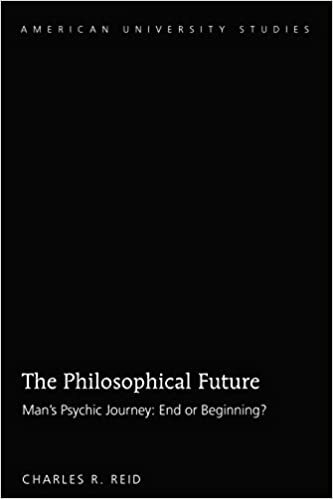 The book tracks the changing defi nitions and control of quoting over the millennia and in doing so throws new light on ideas such as ‘imitation’, ‘allusion’, ‘authorship’, ‘originality’ and ‘plagiarism’. 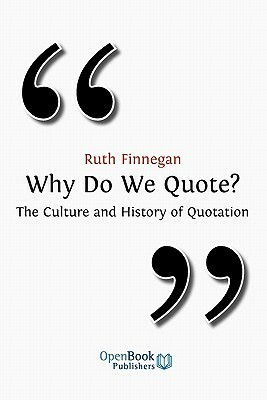 If you’ve ever found yourself wondering why exactly it’s so natural to quote another person, Why Do We Quote by Ruth Finnegan is a great place to start. This book is laid out much like a textbook and goes over the history behind quoting in a comprehensive timeline. The text is easy to read and peppered with anecdotes which is a far cry from many traditional textbooks. 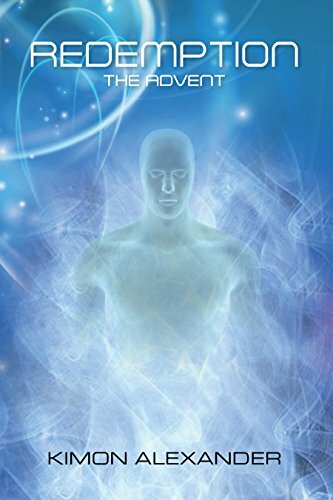 It proves itself to be a wonderful companion piece to any student who may be researching this area as well as informational for an average person to learn more. It’s a look at the subconscious process of quoting and how we are influenced by those around us and what we are exposed to. Quoting itself is something many take for granted and is a process that is so ingrained in our society that we barely realize what we’re doing most of the time. Finnegan will take us on a journey to find out why. The professional layout of this book would have readers believing that they picked up something from a university or college course. Indeed, this book would be a welcomed companion in a variety of studies from English to the Social Sciences. While the content is dense, it is not too heavy a read. The rationalization that Finnegan provides allows readers to identify more with the subject matter, therefore absorbing and learning from it easier. The illustrations match the content well and there are proper citations for what is being used. This is very important for a book about quoting others. Improper citation would ruin any academic or professional credibility. Although this is a study disguised as reading material it may indeed be too heavy for a non-academic to enjoy. 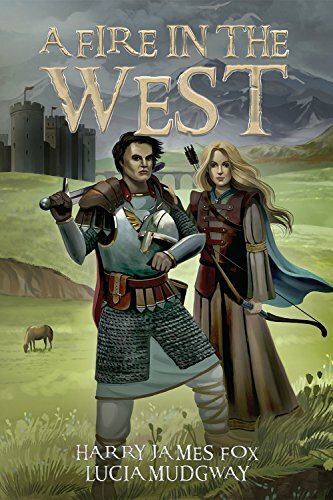 This is not the kind of book you pick up just for fun: you need to be genuinely interested in the contents or else it will be a book you never finish. To that end, this book may not grab the casual reader. As long as you go into this book with the expectation to learn, you will not be disappointed. Finnegan carefully guides her readers on the history of quotation and gently teaches along the way. If you are looking for education and a better understanding of how language works, this is a great piece to add to your collection. This comprehensive history of quoting complete with illustrations is a great piece to add to any student or academic’s library. It’s a fascinating study that is sure to grab the interest of those who enjoy this type of reading. Be wary of its length and don’t be afraid to pause while reading it. Finnegan writes in a way that is easy to put down and pick up. 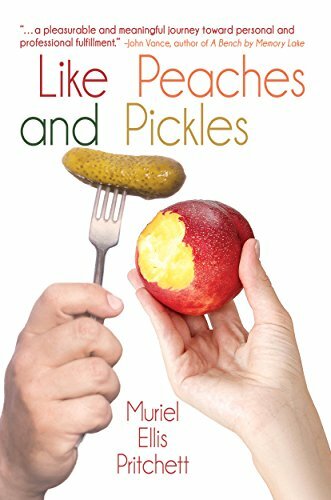 Her personal anecdotes also add flavor to something that might otherwise be dry and boring.